How long have you been in the hotel industry? I’ve been in the hotel industry for about 11 years. What made you decide to join the hotel industry, despite having no relevant experience in hospitality? I love to communicate with people, and to make them happy. When I first joined the industry, the biggest challenge I faced was learning how to deal with unsatisfied guests. I didn’t quite understand why or how they got so upset, even when you did nothing wrong. But my seniors showed me the ropes and taught me how I could deal with situations involving unhappy guests. What were some of the roles you’ve taken on for the past 11 years? I started as a Front Desk Executive. Since then, I’ve been promoted to Front Office Supervisor, Assistant Duty Manager, Duty Manager, Senior Duty Manager and now Hotel Manager. As I took on these new roles, I also had to learn how to handle manpower resources, manage staff members, and keep them motivated at work. Can you tell us more about your current role and what you do on a daily basis? I am a Hotel Manager of 14 hotels. 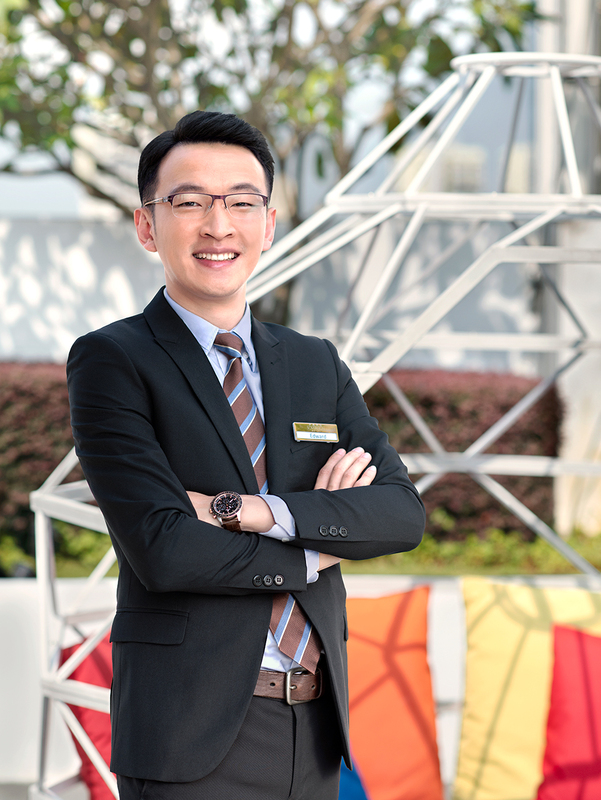 I focus on their daily operations, making sure that everything runs smoothly – from the Front Office to Housekeeping. I also monitor room sales and see how I can maximise the hotels’ revenue. How do you manage so many hotels on your own? Of course, I can’t do it all by myself! I have six Duty Managers working with me. I meet with them every day to get a sense of how each property is doing and to discuss any improvements we can implement. Some of the challenges we try to tackle include helping our staff members grow and become better service providers. We set up training teams consisting of senior staff members who will share their experience and guide the junior staff. Were you given opportunities to learn all the skills necessary to do what you do? Yes, the hotel industry definitely offers a lot of opportunities to learn. Recently, we attended a Study Trip to Japan, where we learned about their culture, technology, hotel practices and ways to improve workplace efficiency. Locally, we also attend language courses to brush up on our communication skills to help us better communicate with guests of different nationalities in order to provide better service. How did you feel when you were given the opportunity to lead two hotels for the first time? I felt challenged. I had just been promoted, and there were a lot of things that I had to learn in a short period of time. But I took it as an opportunity for me to learn and grow, and I tried to carry out my duties to the best of my ability. What motivates you to do more, and give your best at whatever you do? For me, I’m just grateful for the opportunities that I’ve been given. Despite having no relevant experience, I’ve been given plenty of chances to learn and earn several promotions. Our management treats us very well, and rewards us for the good work that we do. So I just want to do my best in return. And of course, there’s the sense of achievement I get from knowing that the room concept I designed has been well-received by our guests. Is there anything you’re particularly proud of? The most memorable experience for me was when we had to accommodate the Premier of Tasmania and his delegates within short notice. We were given one week to prepare for their visit, and we were told to keep their visit as low profile as possible. My team and I selected the best rooms that met their needs. We coordinated with the Australian High Commission to work a schedule around their itinerary. We prepared special welcome messages, floral arrangements, fruit baskets, and even a private parking area for the Premier’s private vehicles. Everything was going smoothly until a few days before the Premier’s arrival, when we were told that the hotel’s restaurant was unable to provide a private room for the Premier and his delegates to have a breakfast meeting. We quickly sourced for an alternative venue, but because of his tight schedule, he could not travel to another location for the meeting. Thinking on our feet, we arranged for them to have their breakfast meeting at our rooftop pool area. We closed off the pool to other guests, set up the necessary furniture and even hired a team of private chefs to prepare a special breakfast for the meeting. We managed to pull off the event with no hiccup, and provided the Premier and his delegates a comfortable stay. They thanked us for our efforts, and we even received a commendation e-mail from the Australian High Commission for a job well done. I was very proud of my team for being able to pull off such a last-minute request. Where do you see yourself in two to five years? I hope to keep doing what I do and, more importantly, to keep enjoying what I do. What advice would you give to someone who is considering a hospitality career? Don’t be afraid to join the industry, even if you have no prior experience. Take me, for example. I had to start from scratch and I still managed to carve a rewarding and fulfilling career for myself. I hope my story can provide some confidence and encourage people to embark on a career in hospitality.